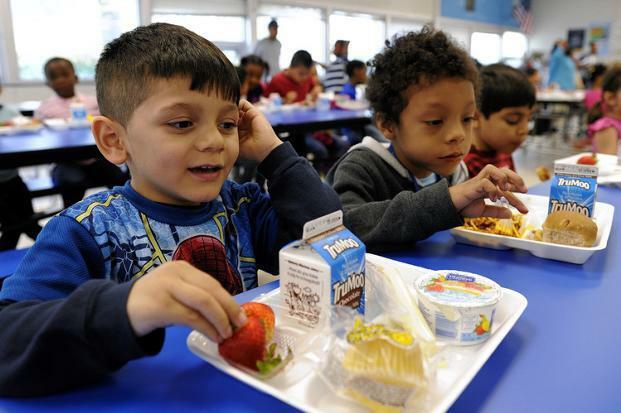 Congress Looks at Reforming School Nutrition Program, but Will Latino Children Make the Cut? Many families depend on The National School Lunch Program (NSLP) and would agree that it is an essential component for nutrition in public schools. Eligible families apply for these services through an application process whereby they provide information regarding their household size and income. Children may also qualify to receive free or reduced-price lunch through direct certification in which schools utilize information from data from other public benefits such as the Supplemental Nutrition Assistance Program (SNAP). Generally, children living in households with incomes below the federal poverty level qualify for free or reduced-price school meals, but not all of these children are certified to receive these benefits. Due to various errors, many needy children are not getting the access they deserve. High error rates in the certification process of eligible children for free or reduced-price school meals have raised concern among school districts, parents, lawmakers, and the civil rights community—not all of which are valid. Some critics of the program claim that many children were “overcertified” and received free or reduced-priced meals when they were ineligible. However, these opinions are misleading as the majority of the errors were misclassifications between free and reduced-priced meals, not due to large numbers of children taking advantage of the system. In addition, the majority of errors occurred from the application process and not through direct certification, which has been found to be the most accurate method of certification. The meal application process creates many opportunities for errors to occur due to language barriers and confusing questions for those filling out the application, such as inputting one’s net pay instead of gross pay. Another cause for error rates occurs through the verification process, in which schools are required to audit approximately 3% of all meal applications. Parents are contacted by school administrators to provide proof of their reported income in order to verify their child’s eligibility for free or reduced-priced meals. However, the verification processes has shown to cause eligible children to lose access to school meals because of parents’ failure to respond due to language barriers and working parents not having the time to provide the appropriate documentation to complete the verification process. On the other hand, parents that do respond to the audit may still see their child lose eligibility due to administrative errors. During the verification process, administrators may input data incorrectly into the system causing a child to no longer be eligible for free or reduced-priced meals. Direct certification increases the accuracy of the school meal application process due to data reliability and reduction of paper applications school districts must review. Many districts have initiated Community Eligibility programs to reduce errors by eliminating the application and verification processes. Through this program, entire schools in low-income communities provide all meals at no charge to students. APEC study found that schools using community eligibility have lower improper payment rates. Representative Todd Rokita recently introduced the Improving Child Nutrition and Education Act of 2016, on behalf of the House Education and Workforce Committee. Although the name suggests the legislation will improve child nutrition services, the bill includes numerous provisions of great concern. The shortcomings associated with this bill could be detrimental to low-income children, hindering them from accessing nutritious meals and potentially being kicked off the free or reduced lunch program. The bill also increases the percentage of applications that should be verified. In addition, the bill will prohibit community eligibility potentially leading to detrimental consequences for children such as losing their eligibility for free meals. Help us ensure that Congress keeps Latino children on the school lunch program by contacting Members of Congress and urging them to oppose any bill that threatens to kick Latino children off the school lunch program. In light of recent anti-LGBT laws sweeping the South, representatives from leading civil rights and public policy organizations convened on Capitol Hill last week to discuss the legislative priorities for LGBT Latinos, a population estimated to be around 1.4 million people. The panel hosted by LULAC spotlighted the new public policy priorities of the National Hispanic Leadership Agenda (NHLA), a coalition of 40 Latino advocacy organizations that investigates some of the most pressing concerns of the Latino community and recommends policy solutions that will have a lasting impact on Latinos, including LGBT Latinos. The panel featured policy discussions on the anti-LGBT laws in Mississippi and North Carolina and reproductive rights with representatives from the National Latina Institute for Reproductive Health, The Leadership Conference on Civil and Human Rights, True Colors Fund, National Center for Transgender Equality, and the National LGBTQ Taskforce. Just as African Americans and Latinos were once forced to use segregated bathrooms, a new war on the right to use public facilities is now being waged against transgender people. Joanna Cifredo of the National Center for Transgender Equality (NCTE) spoke on laws passed within the last two months in the South known as “bathroom bills”, which deny people the right to use bathrooms that correspond to their gender identity. In Mississippi, an anti-LGBT law set to take effect in July allows organizations and businesses to deny services based on religious grounds. The law passed right after the North Carolina state legislature passed their own “bathroom bill”, HB 2. More than 50 people were arrested at the North Carolina state house in protest of the anti-transgender law. The Department of Justice has also sued the state for violating Title VII and Title IX of the Civil Rights Act — which prohibits discrimination in the workplace and in federally funded programs such as public schools — and for violating the Violence Against Women Act. Supporters of the “bathroom bills” reason that women will be at risk of “sexual predators” posing as women; however, Cifredo said this conversation is not about bathrooms, but about a greater movement of policing bodies and limiting trans people from participating in public life. “It is a fear tactic we’ve seen time and time again of certain politicians preying upon the ignorance of their constituency and feeding them fear of a marginalized population that they know little about,” Cifredo said. The NCTE, the Human Rights Campaign, and the American Civil Liberties Union say no evidence supports the claim that women have experienced violence at the hands of transgender people in bathrooms. On the contrary, studies show transgender people are the ones most vulnerable to discrimination and violence when forced to use bathrooms that do not match their gender. A reported seventy percent of transgender people in Washington D.C. say that they have been denied access and have experienced verbal harassment, or physical assault in public restrooms, according to the Williams Institute at the UCLA School of Law. Another study by the Journal of Homosexuality found nearly half of trans college students attempted suicide when denied bathroom access, a number that increases when students were of color or of lower income. As panelist Sergio Lopez, Field Manager of the Leadership Conference on Civil and Human Rights, pointed out, the Constitution has been a double-edged sword for advancing and limiting religious freedom because of how the First Amendment and Equal Protection Clause can conflict with one another. The Religious Freedom Restoration Act (RFRA) passed by Congress in 1993 also protects people’s practice of religion and has been used to preserve the rights of religious minorities, such as Muslims and Native Americans. However, a recent report by the Leadership Conference Education Fund, the research and education branch of the Leadership Conference, says the policy is being used by people and businesses to justify discrimination against the LGBT community and violates the Constitution. Zsea Beaumonis, a fellow at the National LGBTQ Taskforce, advocated for passing three policies to ensure LGBT and reproductive justice including the EACH Woman Act, Equality Act, and the Sentencing Reform and Corrections Act. The EACH Woman Act is based on protecting women’s reproductive rights, an issue that has been intensely contested in light of efforts to defund Planned Parenthood and the Supreme Court’s pending trial regarding the constitutionality of Texas’s HB 2 law, which has closed more than half of abortion clinics in the second largest state in the country; only 10 remain open to treat women seeking abortion. Mark Salay is the Communications Intern at the LULAC National Office in Washington, D.C. He is a senior at the University of California, Santa Barbara, majoring in communication with minors in history and professional writing, and will be graduating in the Spring of 2016.